Over the last thirty years, we have known a lot about prehistory of mice from DNA studies. Domestic mice (Mus) lived on human stored food and food debris for ages. Thus they could be called a commensal as well as a pest. Mus lived only in north India since 900,000 years back, (1) as a commensal of Homo erectus and later of Homo sapiens sapiens (Ferris, 1983). (2) This commensal relation between Homo erectus and Mus is indirect evidence that Homo erectus had India as his predominant habitat. Mus diverged into three principal species, viz. Mus musculus domesticus, M. musculus musculus and M. castaneus by 500,000 years back (Geraldis, 2008; Din, 1996), and all the species continued to live in India. (3) In India, Homo erectus lived then. When Homo sapiens sapiens inhabited India in about 100,000 ybp or earlier, these species became adapted to live in and around human dwellings (Boursot, 1993). (4) Mice probably felt safer there. Tsutim et al (2008) found that human environment gives protection to sparrows from being predated by carnivorous birds and animals. (5) The same applies to mice. It is generally accepted that existence of these mice was so much dependant on human food, that they migrated with man as a passive migrant. “One of the most characteristic features of house mice life history is probably its commensalism in relation to humans. The worldwide colonization by this species is mainly due to passive transport by humans and is a consequence of its ecological dependence on humans.”(6) If not all, most of the Mus species can be found in India. 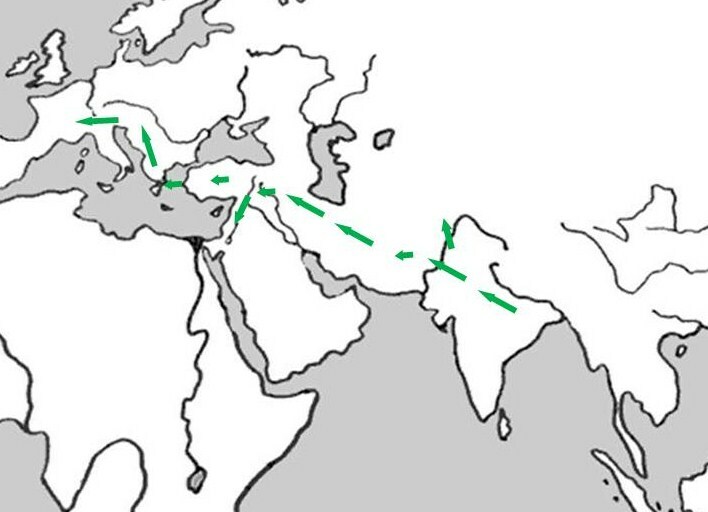 Prager et al identified samples from Afghanistan as Mus musculus musculus and castaneus and samples from Pakistan, North India and Nepal as castaneus. (7) “Genetic data indicated that ranges of musculus, custaneous and domesticus likely correspond to three distinct paths of expansion from the Indian cradle.”(8) In fact later discovery of migration routes and distribution ranges of human male lineages (Y-DNA) R1a1a (Underhill, 2009); O2a (Kumar, Vikrant, 2007) and J2b (Sengupta, 2006; Priyadarshi, 2011) exactly overlap those of the three main Mus species. Fig. . Showing distribution of Mus cervicolor in rice fields in the Southeast Asia. From Groves, Colin P., Of mice and men and pigs in the Indo-Australian archipelago, Canberra Anthropology 1984, 7:1-19. Black rat (Rattus rattus) is another species which originated in India and then migrated to other parts of the world. From India it migrated to West Asia and then to Europe. Rattus reached West Asia by 20,000 years before present, a date which is earlier than domestic mouse migration. (12) Other migration of this species was from India to Madagascar and Western Indian Ocean. (13) This was possibly because some Indian farmers migrated to Western Indian Ocean shores (at 20,000 ybp), earlier than the supposed date of agriculture in West Asia. Hence in pre-Neolithic Iran, West Asia, Central Asia and Chinaboth man and carnivores alike possible hunted any mice leaving Indiaand reaching those countries. Domestic mouse is the only animal which has stayed in Indiafor over 900,000 years without leaving this country until dispersal of farming started. We have noted that Pre-Pottery Neolithic agriculture started in Indiaroughly about 13,000 ybp to 14,000 ybp. Mus domesticus reached theEastern Mediterranean basin in about 10,000 ybp. 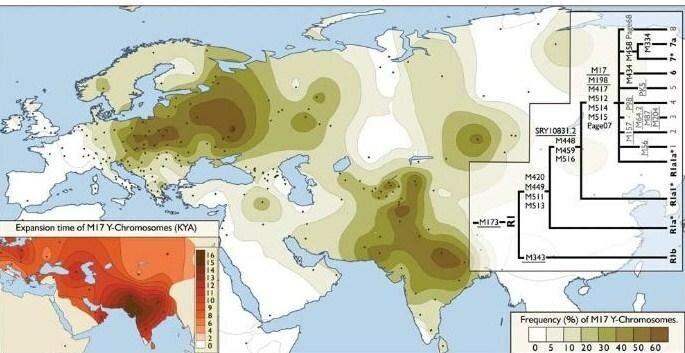 (18) We can corroborate these two findings and say that 3000 years was the time required for migration of mice from India to West Asia, the time which actually lapsed in migration of Pre-Pottery Neolithic fromIndia toWest Asia. Logical inference is that agriculture began first inIndia, possibly much earlier than we can imagine, which kept mice bound within Indian land for ages until finally agriculture itself migrated out ofIndia. 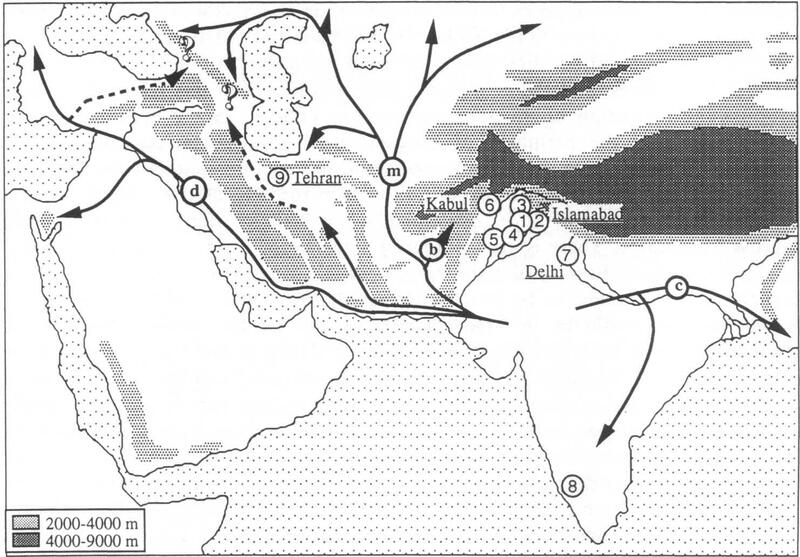 (19) The route map of mice migration as mapped by the geneticists is exactly the same as that of human migration. It is obvious by comparing the above picture with route and range of musculus that distribution of Mus musculus and R1a overlap. Fig Source: Priyadarshi, P., The First Civilization of the World, Siddhartha Publications, Delhi, 2011. 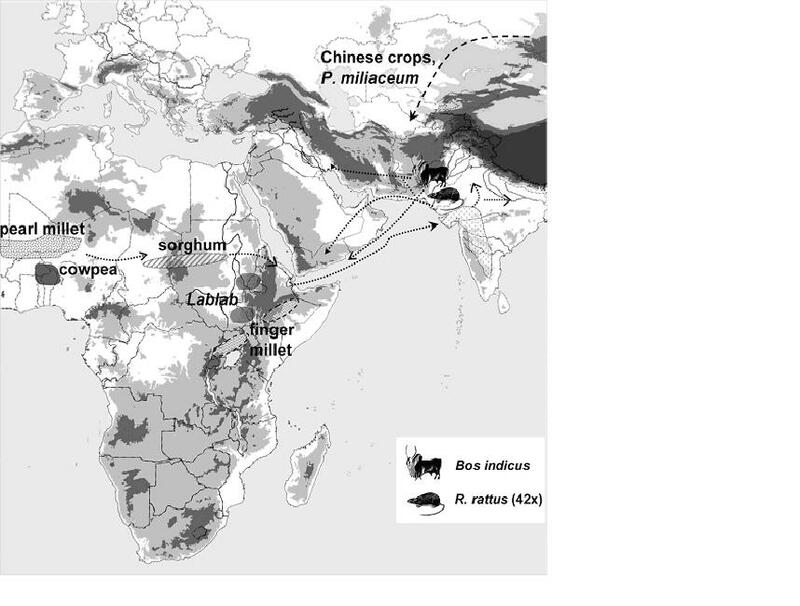 Protracted commensality of Mus m. domesticus in India indicates that Homo sapiens sapiens was doing some primitive farming or foraging and storing food since much before actual onset of Neolithic migration. Indians of that era had possibly a settled life and home and they depended on cereal, fruit and tuber diet. Initially, population was small, and land abundant. Hence cultivation was not needed. Man used to harvest ripe grains (rice, barley, millets) from wild fields and store them. This stored food kept Mus domesticus tied to the Indian households. Pestering of human households by mice forced man to use more and more burnt clay pottery, and it must have prompted him to invent and use metal pottery much later in history. The other sub-species of mice which migrated out of Indiato Southeast Asiais Mus castaneus. This species seems to have migrated a bit earlier, and it had been adept at digging holes in soil over hundreds of thousand years. Probably they learned to do this in a bid to eat tubers which grew in plenty under Indian and Southeast Asian soil. Mus caroli is another species of Southeast Asian mice which dwells in rice fields. It seems to have migrated much earlier than other species. Cognate words for ‘mouse’ are found exclusively within the Indo-European family of languages (English ‘mouse’, Latin mus, Sanskrit mUSaka, muSika, mUs, muSka, (22) Pahlavi musk), indicating expansion of domestic mouse out of India with migrating Neolithic culture of the Indo-European speakers of north India. 1. Boursot, P., et al , Origin and radiation of the house mouse: mitochondrial DNA phylogeny, Journal of Evolutionary Biology 1996, 9: 391-415. 2. Ferris, S. D. et al, Mitochondrial DNA evolution in mice, Genetics 1983, 105(3):681-721. 3. Geraldis, Armando, et al, Inferring the history of speciation in house mice from autosomal, X-linked, Y-linked and mitochondrial genes, Molecular Ecology 2008, 17(24):5349-5363. Also, Din, W. et al, Origin and radiation of the house mouse: clues from nuclear genes, Journal of Evolutionary Biology 1996, 9(5):519-539. 4. Boursot, P. et al, Evolution of House Mice, Annual Review of Ecology and Systematics 1993, 24:119-152. 5. Tsutim, Ido, et al., Foraging Behavior of Urban Birds: Are Human Commensals Less Sensitive to Predation Risk than their Non-urban Counterparts, The Condor 2008, 110(4):772-776. 6. Wilson, D. E. and Reeder, D. M., Mammal species of the world: A taxonomic and geographic reference, JHU Press, 2005, p. 1401. 7. Mentioned by Wilson and Reeder (ibid), p. 1401. 8. Ibid., p. 1401. Quoted by Wilson and Reed, and originally said by Boursot et al, The Evolution of House Mice, Annual Review of Ecology and Systematics, 1993, 24: 119-152; see page 128. 9. Groves, Colin P., “Domesticated and Commensal Mammals of Austronesia and Their Histories”, in Bellwood, P., Fox, J. and Tryon, D., The Austronesians: Historical and Comparative Perspectives, 1995. Also, Groves, C. P., Of mice and men and pigs in the Indo-Australian archipelago, Canberra Anthropology 1984, 7:1-19. 10. Groves in Bellwood, P. et al, 1995. 12. Alpin, Ken in Science News, Science Daily, Feb. 6, 2008. 13. Tollenaere, C. et al, Phylogenpgraphy of the introduced species Rattus rattus in the western Indian Ocean, with special emphasis on the colonization history of Madagascar, Journal of Biogeography 2010, 37 (3): 398-410. 14. Fuller, D. and Boivin, Nicole, Crops, cattle and commensals across the Indian Ocean: current and potential archaeobiological evidence, Etudes Ocean Indie 2009, 42-43:13-46. 15. Macholan, M., Bonhomme, F. et al; “Genetic variation and phylogeography of free-living mouse species (genus Mus) in the Balkans and the Middle East”, in Mol Ecol 2007, 16 (22):4774-4788. 16. Munro, Natalie D., Small game, the younger dryas, and the transition to agriculture in the southern Levant, Mitteilungen der Gesellschaft für Urgeschichte 2003, 12: 47-71. p. 53. 17. Hockett, Bryan Scott and Bicho, Nuno Ferraria, The Rabbits of Picareiro Cave: Small Mammal Hunting During the Late Upper Palaeolithic in the Portuguese Estremadura, Journal of Archeological Science 2000, 27(8):715-723. 18. Cucchi, Thomas, Vigne J. D. and Auffray, J. C., First occurrence of the house mouse ( Mus musculus domesticus Schwarz & Schwarz, 1943) in the Western Mediterranean: Western Mediterranean: a zooarchaeological revision of subfossil occurrences, Biological Journal of the Linnean Society 2005, 84: 429-445. 19 Rajabi-Maham, H., Orth A and Bonhomme F., Phylogeography and post-glacial expansion of Mus musculus domesticus inferred from mitochondrial DNA coalescent, from Iran to Europe, Mol Ecol 2007, 17(2): 627-641. Also, Cucchi, T. and Vigne, J., Origin and Diffusion of the House Mice in the Mediterranean, Human Evolution 2006, 21(2):95-106. 20 Bonhomme, F., Species-wide distribution of highly polymorphic minisatellite markers suggests past and present genetic exchanges among house mouse subspecies, Genome Biology 2007, 8:R80. 21. 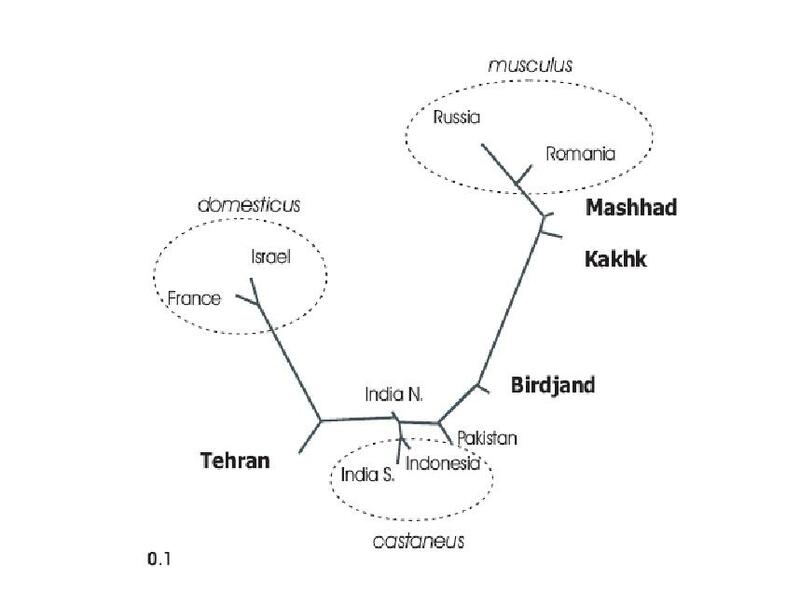 Rajabi-Maham, H. et al, Phylogeography and postglacial expansion of Mus musculus domesticus inferred from mitochondrial DNA coalescent, from Iran to Europe, Mol. Ecol. 2008, 17 (2): 627-41. 22. Monier Williams Sanskrit English Dictionary, Cologne Scanned copy on the net, pp. 824, 827. This entry was posted in Uncategorized and tagged 1996, Afghanistan, argentiventer, Auffray, Bandicoot, Bandicota, bengalensis, bonhomme, Boursot, Boursot et al, castaneus, cervicolor, commensal, Cucchi, Dispersal, domestication, domesticus, Farming, Fuller, haplogroup J2, Haplogroup R1a1a, India, Indo-European, Madagascar, mice, migration, mouse, mus, musculus, nepal, nitidus, Origin, Pakistan, pest, Rajabi-Maham, rat, rattus, rice field, south Asia, Thomas, Tsutim, Vigne. Bookmark the permalink. A good paper that deserves wider circulation. great work. The visuals and the data make it easy to understand and promote. Keep up pushing the truth, and one day the tide will turn in our favor. Its our destiny, no one has even conquered india and sooner or later india always returns back to its roots, whether its the christians or the muslim occupation, india always overcomes. Its great to see a person like you who i can follow and educate. You should consider creating a website with other great indian scientists, and start to PUSH this in indian schools and universities, thats the only way we can overcome the Biased colonial western racist education system in india which has assumed the role of a great education people like YOU need to show that actually the colonial education is not an education when its SO politcally involved with the british ideology. We are made to humilate our own history, its people like you thats gona chagne that! I have one further question. In your opinion does sanskrit originate from tamil?…..thats my final question. In other words, sanskrit and vedic culture arose from dravidian culture or was it some other way…..This is very important to work out…….Thank you very much. You really smashed it once more amigo carry on the good work I often get enjoyment from your blogposts! 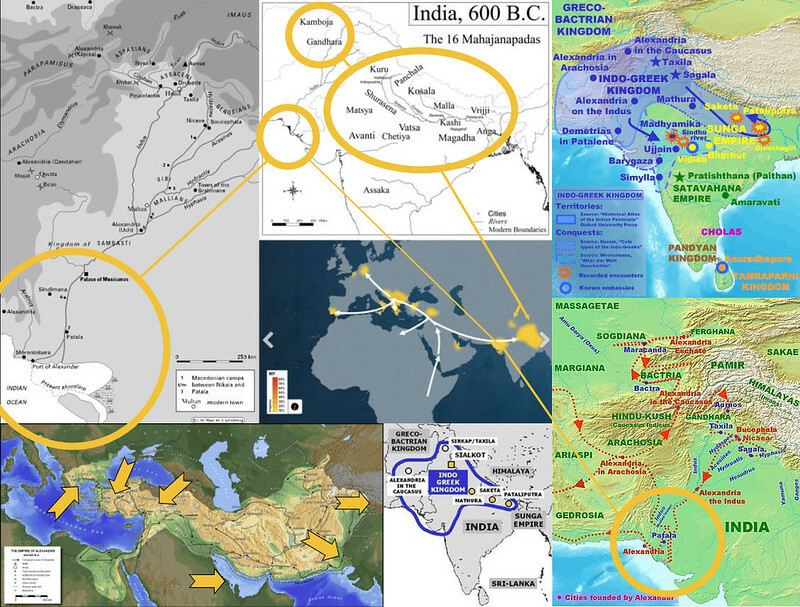 Migration of Indians Across Continents spanning generations: A Case History of the Saluja Family. Well the assumption that Alexander’s army brought J2b to India is just an assumption and it cannot explain the presence of the J2b in south India as well as the Indian tribes. J2b has entered southeast Asia also earlier than the date of arrival of Alexander’s army. An interesting article about second langauge in our genes.